Farro would probably still be an extremely local specialty had the farmers of the French Haute Savoie not begun to supply it to elegant restaurants that used it in hearty vegetable soups and other dishes. Their success sparked renewed interest in farro among gastronomes, and now the grain is enjoying a resurgence in popularity in Italy as well, especially among trendy health-conscious cooks. At this point you may be wondering exactly what farro is. According to Garzanti’s Italian-English dictionary it’s spelt, but Luciano Migliolli, author of Il Farro e le sue Ricette (Farro and its recipes), says that though it looks rather like spelt they’re not the same. Farro must be soaked, whereas spelt can be boiled straight off. Also, cooked farro has a firm chewy texture, whereas spelt softens and becomes mushy. What this means is that you have to read the package carefully when you purchase farro (a well-stocked delicatessen or health food store should have it) to make certain you are getting Triticum dicoccum (farro’s Latin name). If you cannot find farro spelt will work, and you should be able to use barley or other whole grains as well — the results won’t be quite the same and you will have to adjust the cooking times, but the dishes will be good. Farro is divided into 3 grades. 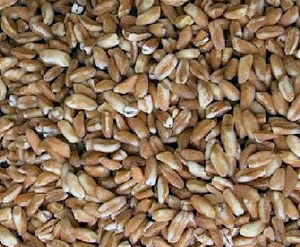 The best has grains 6-8 mm long (1/4 to 1/3 of an inch), the second has grains 3-5 mm long (1/8 to 1/4 inch, which can be inappropriately labeled farricello, the Italian for spelt), and the third consists of cracked grains broken during processing. Mr. Migliolli suggests you purchase whole grain farro and crack it at home, if the recipe calls for it, by whirling it in an electric coffee grinder or blender — this way you avoid purchasing dust or stones. Once you have purchased it, store it like any other grain, in a sealed glass container in a cool dry place. Before you can use it you do have to prepare it: Wash it well, picking out impurities such as bits of chaff, pebbles, or bad grains, and soak it for at least 8 hours. It will keep in this soaked state in the refrigerator for a few days. Come time to cook it, either add it to a soup or boil it by itself, for 2 hours in a normal pot or one in a pressure cooker (halve these times if you are using cracked farro). One thing that you should keep in mind is that farro will continue to absorb liquid and soften once it is done, so you should let it sit for a while if you can. Another way to cook farro for minestrone and such is to set it to boil directly in abundant vegetable broth (for example from boiling beans, chick peas, or cabbage) for a couple of hours, then let it rest and puff up for at least 8 hours before stirring it into the soup pot. The farro will absorb lots of vegetable flavor, but you have to make certain you have sufficient vegetable broth handy for making the soups as well before you begin. via Farro: Grain of the Legions. See Tomato Soup with Farro and Basil for a great Farro dish!